I don’t feel like swimming. This bothered me some, since I have a very nice swimming pool and had been trying to get to it for a couple of days. As I tried to analyze this, I remembered some recent Chinese vocabulary I was learning. I wondered how it applied to this situation. I cannot swim (at all ever). Today it is not possible for me to go swimming. Today I cannot swim (due to certain circumstances or conditions). Today I shouldn’t swim, otherwise tomorrow I will be too tired to run 15 miles. I run, swim, and ride a bike, so should feel strong, but if I don’t feel it…. It is very likely that I need to take a rest day. I must not go swimming today. Because it really is all up to me. Today, I will not go swimming. If I want to run well tomorrow, I must rest today. 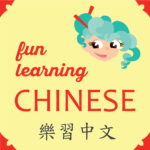 Who knew that learning the Chinese language could be so helpful in figuring out my swimming schedule? 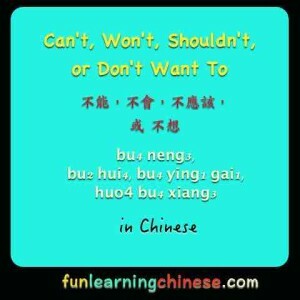 不了了 after a verb means there is an existing condition that inhibits carrying out that activity, but if that reason ceases to exist, then the activity would again be an option, like getting chores done or the weather changing. 感覺不到 is a common phrase that means some thing is not felt, like love or warmth. ❹Here is a link to a website that tries to explain “expletives.” They are apparently words either that help with the structure of a sentence, but have no real meaning of their own; or they are “cursing or oaths” that add emotion, but not real meaning.